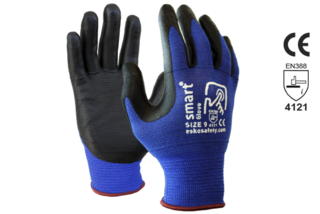 Touchscreen Glove, Black Nitrile palm coat with Blue Liner. ESKO E300 'GRIP-IT', Nitrile Palm Coated Glove with Hi-vis Nylon Liner. Sizes: 7 - 11. -Hi-vis knitted nylon liner with nitrile palm protective coating. -Strong abrasive-resistant coating with sensitive touch. -Handling for both wet and dry conditions. Use your touchscreen smart phone or tablet while wearing these gloves. No need to keep removing gloves to use your phone.